I won’t bore my readers with lengthy explanations as to why I’ve been silent on this blog, or ruminate on how to make the time, and how that’s easier said than done. Much easier said than done, as I’ve learned in the last few weeks. Instead, I’ll doff my cap, humbly apologize, and move right along. You can’t get back on the horse without putting your foot in the stirrup…or something like that. So, right to it. In my time “away,” I had lots of time to miss reading. Especially reading Indie work. In such a lapse as this, it would have been easy for me to step back from the Indie Writer’s world completely, and let it run along as it does. In fact, I was so deep into my work that I didn’t read anything, let alone write. I’ve built a habit of reading and reviewing Indie work in the last several months, but like any habit, if you let it lapse long enough, it can fade away. You lose the routine. Fortunately, in the midst of my busyness, I had a wonderful reminder of why we do this. 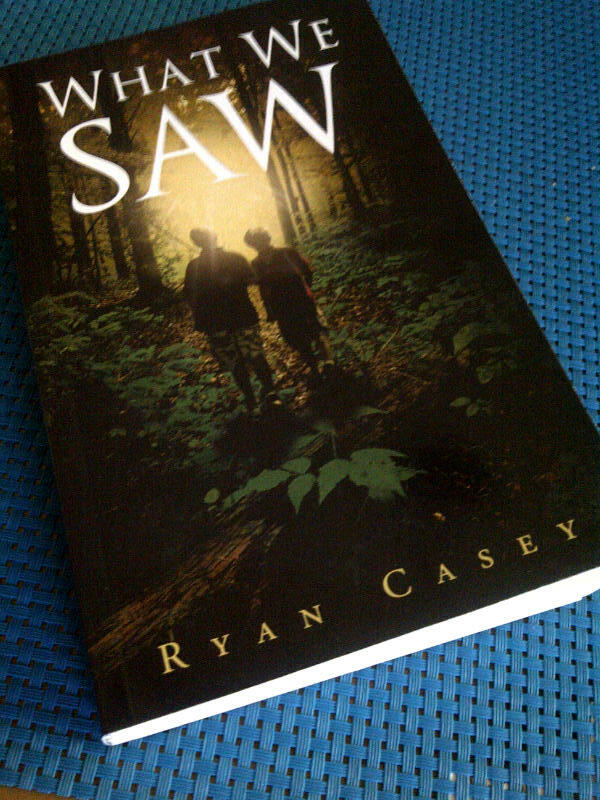 Ryan Casey’s debut novel What We Saw came in the mail. Some time ago, Ryan started a crowd sourcing initiative on Pozible, to raise money to have his book printed in paperback. It was very successful–his goal was reached in twelve hours, and he ended up raising close to double his goal in the end. He said it was an experiment, and it’s one we can all learn from–know what you want, find out how to get it, and just do it. It was also a wonderful example of how well the Indie Writer’s community works together. You don’t find this kind of collaboration in the Traditional Publishing Industry. I contributed a modest sum to his campaign, and the reward was a copy of his paperback. Living overseas from him, I didn’t receive it until recently–such is the way of snail mail. But really, it couldn’t have come at a better time. I’ve been doubting myself lately in terms of my writing–never making the time, at a loss for ideas, spinning my wheels on ideas I have developed. I recognise all of this as part of a cycle I’ve been a part of for years–it means I’m winding down, and will soon put down the writing for years, until I get the urge to try again. Or, that’s been the pattern. Receiving Ryan’s book reminded me of two points: that achieving your dreams can be as simple as pursuing them with abandon, and–this is the important one–it’s not impossible to achieve them. Not even close to impossible. Here was the physical proof: a genuine professional grade paperback novel, written by a young guy in between his studies at University. And this isn’t vanity press; he’s made some real money off this venture. It’s an excellent book. It’s got legs. And all because Ryan had an idea, a dream, and a plan to go out and grab it. And it’s really as simple as that. I’ve got lots of work to do, and lots coming up on Speaking to the Eyes. Bear with me as I get back into the swing of things, but watch this page for upcoming reviews of J.M Ney-Grimm’s Troll Magic, news about a great contest by Indie juggernaut J.F. Penn, and of course, the ruminations of a writer/reviewer trying to learn his way through the world of Self Publishing! Imagine, for a moment, a tower that’s built piece by piece over a number of years. It starts as a one story house with a solid foundation; over time, another story is added, then another. Soon it reaches into the sky, and grows higher and higher. It gets that cartoonish curve you see when someone draws something tall and rickety. If it keeps getting higher, what’s going to happen? It’ll crumble like a house of cards. Unless, of course, you continue to work on the foundation. This is the trouble, I find myself in currently. Over the weekend, my wife and I were doing some shopping and I had a creative epiphany that solved one of the question I’ve had about my Tapestry Project: how do I bring my main conflict–a behind the scenes war between gods–into the forefront so it means something to the characters? The idea was a war between two fey tribes, the Winterkin and Summerchilde. The conflict has been waged for centuries in an alternate plane of existence, and it’s now bleeding into the real world. Sounds compelling, or so I thought. The problem was that, in shoehorning this concept into my existing framework, I’ve effectively built too many stories (forgive the pun). Magic in my World is a product of the Elements–I’d have to equate that somehow to the seasons if I have Summer and Winter fey tribes. I haven’t introduced fairies into my story, so I have to make them fit before giving my characters that identity. Having an unseen world that lurks beneath Tornum gives a lot of opportunities, but requires some retooling to make sense. And, ultimately, I’d be adding a core concept to the book. Really, this epiphany doesn’t work–not for this story, anyway. I like the idea and may use it elsewhere, but for Tapestry, it’s a dead end. But it was revelatory for another reason. It showed me that my overall story, as much as I’ve worked on it and tinkered with it over the years, has an awful lot of holes. It’s a tower waiting to be toppled by the slightest breeze. Why? Because I keep adding to it. It’s a good story–I think so, anyway. It’s one I’ve wanted to write for a long time, and I’m excited to finally be doing it. But it’s become larger than itself now, and I’m trying to incorporate too many disparate elements in an effort to make it interesting. This is what happened the last time I put it down. It collapsed under its own weight, and I simply couldn’t keep it straight anymore. This time, I don’t intend to abandon it–but something needs to be done. This is a very valuable lesson for me. If something as simple as a cool idea can tear the foundation of my story to pieces, there’s something wrong. I need to repair the foundation, rather than thinking up new and creative ways to solve the problems inherent in the story. I didn’t expect that lesson, but I’m glad for it. It’s given me a lot to think about. How do you do that? I’m just learning that myself, but this article is a great place to start. In the back of my mind, I’ve known for a while that my story is getting too complicated. Most of the research I’ve been doing will end up in the ‘background,’ colouring the characters, setting and themes, but that doesn’t mean it’s strong, or relevant to the story. I have to find our what is, and go with that. This is what I’ll need to consider over the next while. Do I need to involve kabbalah, I Ching, Tarot, astrology, alchemy and theological philosophy? Do I need to have each character’s name reflect some esoteric or occult meaning? What’s really important for this book? The answer to that question, simply, is the story. That’s what’s important. I can have all the window dressing I want: if the story isn’t good, the book’s not good. 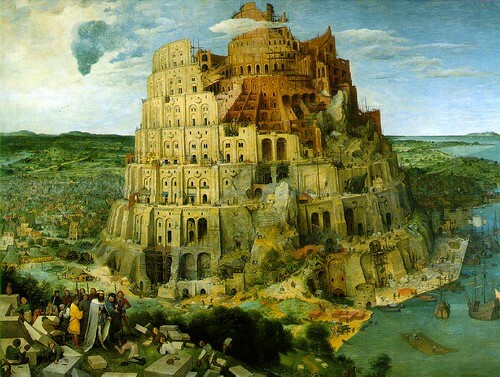 The narrative is the foundation–and I can add as many stories to the tower as I want, it won’t do a lick of good if I don’t have a strong foundation. So where does this leave me? I’m of a mind to shelve the project for a while, work on something else, and come back to it with a clear head–something suggested in the article above. I’m wary of that though, because I know myself. If I put it down, even for a couple weeks, there’s a chance I’ll neglect it completely. So for the moment, I’m going to continue working on it–through research, if not actual writing. I need to get back to basics, and my research on Tarot will give me that anchor. Once that’s complete, I should be able to get a clearer view of the overall story, do some revised plotting and outlining, then dive right back in. In the meantime, this is something I needed to learn, and I’m glad it came when it did (as opposed to, say, after releasing the first stories in this project). It’s a lot easier to fix the foundation if you haven’t built the tower already. Scrivener: A great program just got better! Last week, I mentioned that I was learning to use OneNote, and trying to find a convenient way to sync between computers. I’ll tell what I found below, but first, I want to talk about a happy accident I had along the way. I discovered you can run Scrivener off a USB drive. Now, I work a regular 9-5 job, and between that and family life,my typical writing time is usually Saturday and Sunday mornings. But I also get to work about an hour before my workday starts, so I’ve taken to writing or researching in the morning. This is great, except that I don’t have access to Scrivener at my work computer and doubt I could convince IT it’s a necessary program for my job. So I’ve been using a combination of Sugarsync and/or Google Drive, both of which I’ve used in the past with great effect. But it’s an extra step: when I get home, I have to copy and paste my work into Scrivener. And when things get really busy at work, I sometimes forget to do this and end up with contrasting versions on both machines. Not efficient. So in researching how to update OneNote conveniently, I found out that you can run Scrivener from a flash drive. You can actually install the program onto the drive, though the Literature and Latte folks (creators of the program) don’t recommend it because flash drives are generally slower than PCs. Instead, they suggest installing to your computer as normal, then copying your files over to the USB through explorer. Though I don’t use a Mac, I’m sure there’s a similar procedure. Once you do this, you can open your Scrivener files on another machine through the USB stick. Voila: I can now use Scrivener on my off time at work! A caveat: when you plug your USB into another computer and start the program, you’ll be asked to enter a registration number or use the trial version, even if you’ve already purchased it. This is only because Scrivener verifies your license through the ‘net, and the new computer won’t be registered. Fortunately, the Scrivener license allows you to use the program on up to 10 machines (as stated on their Technical Support page), so all you need to do is input your registration number again and you’re good to go. If you don’t have your number (it’s not accessible through the program), you can go here to have it retrieved for you. I’ve raved about Scrivener before–if you’re a serious writer, it’s one program you shouldn’t do without–but I really have to say that it keeps impressing me. This is an excellent tool for writers, and with this revelation, it just got a whole lot better. Now to OneNote. This is less of an issue for me now–the reason I was using it for gathering research was because I couldn’t use Scrivener on my computer at work. Now that’s moot–but it’s still a useful program. OneNote 2010–which I have on my home computer–has a nifty feature where you can synchronize your workbook to Microsoft Skydrive, which will then synchronize it to your other computers. As long as they also have OneNote 2010. At work, I have 2007, so this isn’t an option. I’ve had trouble syncing the notebook between the two computers, and it’s getting a bit cumbersome. It’s a tad disappointing that the 2010 file can’t open in 2007, and can’t convert without additional software–after all, Word 2010 can be opened in an earlier version. The best I can seem to do is save my pages individually in 2007 format (I can’t seem to save the whole notebook in 2007), then open them on my work PC from there. It’s not nearly as streamlined as it really should be for a program whose whole purpose is to make and share notes, but maybe I’m missing something. If anyone has any tips to share, please leave them in the comments! Ultimately, as I’ve said, this is now moot. If I can use Scrivener to compile my research from both machines, it’s simpler than using two different programs. OneNote still has its benefits, but I’m not sure I’ll continue using it for my projects. Sorry Microsoft–another case of a Mac product winning out! A bowl fills drop by drop. I found it very apropos to my journey into e-publishing so far. It’s been a learning curve, and I’m finding tons of little details need to get taken care of–most of which I’d never thought of before. Drop by drop indeed. And then, sometimes, there’s a splash. This morning, I received notification by the Government of Canada Library and Archives informing me that my application for a publisher’s block of ISBN numbers had been approved. Which means that I can now add ISBN numbers to any of my forthcoming published works, all online, all at the click of a button–and all for free. Not that I’m bragging. Getting an ISBN number has always been a goal of mine, in a geeky spent-too-much-time-at-the-library-as-a-kid kind of way. I always figured that, as a writer, it would be one of those great measures of success. Get an ISBN number, and your book could be sold in bookstores. It could be stocked in libraries. It’s in a national database. Suddenly, that bowl is filling pretty darn quickly. Of course, in the world of e-publishing, it’s pretty easy to get an ISBN number, and it’s not a validation of your writing by any stretch of the imagination. Still, it’s a significant step for me, and one that makes this goal of mine seem more within reach than ever. Anyway, ISBN Numbers. Why bother? An International Standard Book Number is used to set one publication apart from another–even separate editions of the same text. It’s an important tool for librarians and booksellers, allowing them to easily categorize and track books. For eBooks, it’s a bit different. The ISBN (you might see eISBN) is obtained in the same way, and serves the same purpose. But not all vendors require one. The Kobo and Amazon and Barnes & Noble stores don’t require an ISNB, though you can add one if you like. The Apple and Sony stores do–and by extension, Smashwords requires an ISBN if you want to be included in their Premium Catalogue, which pushes titles to both those stores (you can still publish on Smashwords without an ISBN, just not in the Premium Catalogue). Which brings us back to the question. If many distributors don’t require one, why bother? If you don’t mind not getting into the Sony or Apple stores, maybe you don’t need one–but an ISBN is nevertheless a helpful marketing and tracking tool that could give you an edge. Of course, there’s also the expense to consider. In the USA, there’s a service charge for getting an ISBN. On ISBN.org, they’ll cost you between $27 and $40 each to start, but you buy them in blocks of ten. Smashwords seems to offer them for free. And if you live in Canada–which encourages the creation of new Canadian Creative Content–all you have to do is go to the Canadian ISBN Service System . Sign up, and in a couple weeks, you’ll be assigned a unique ISBN publishers block. From there you’re only a couple clicks away from a unique ISBN for each new publication. Easy! This might be a good time to remind everyone that my collection The Astrologers and Other Stories will be published soon–I’m aiming for a release date of October 23. It will be priced at $2.99, but I’ll be offering the titular story separately for free. Look for it on the Kobo Store and Amazon.com soon! Last time, we spoke about the very basics of doing a book cover–today, another integral piece of the puzzle, formatting! Before I got into e-publishing, I thought I knew what publishers wanted when you submit your manuscript. There are certain protocols you’re supposed to follow–name in the upper left corner, word count in the upper right, etc. The purpose of this is for the agent or publisher to have a quick reference, and for the editor to be able to easily get around your work. In e-publishing, though, the writer is filling most of those roles, so the game is completely different. 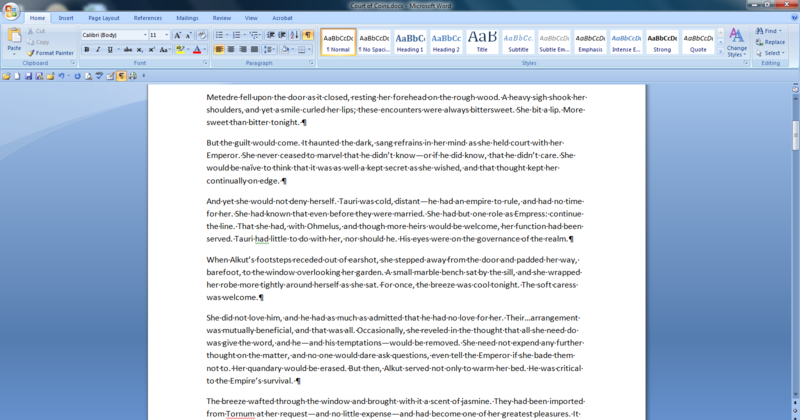 So why not just write the book in MS Word the way you want it to look, upload it to Kobo or Amazon, and press publish? If you do that, I’ll guarantee you one thing: the end product will look horrible. 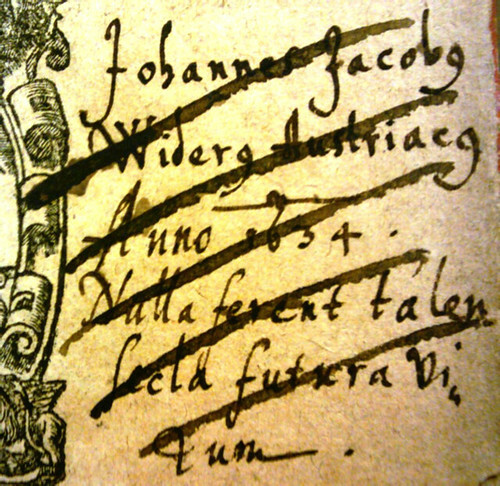 Formatting Marks: note there are even dots to indicate the space between words. and find the option that shows your formatting marks. (In Word, go to Options, Display, and Show All Formatting Marks.) Your manuscript will be riddled with symbols; this is coding Word inputs into your file as you’re writing to determine what the output will look like. What many people don’t realize is that Word is not a What-You-See-Is-What-You-Get program. Far from it! Here’s another experiment. Copy a paragraph of your manuscript, open a blank file in Notepad, and paste it. The text should go, unbroken, on one line, and you’ll have to scroll to the right to see it all. This is because .txt files, unlike files from word processors, don’t have “Word Wrap,” meaning that the text will go on forever until a new paragraph is started. Looks hard to read, right? 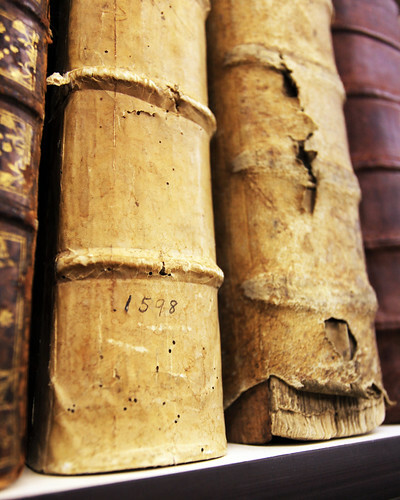 Surely we want our manuscripts to “wrap” when we format them for eBooks, right? Actually, no. The thing is, there’s no standard for electronic books. Many–I’d even say most–go with the ePub format, while others–like the ubiquitous Amazon Kindle books–are .mobi files. There are several other formats; the point is, they’re all programmed differently. So when you upload a particular file to, say, Kobo, it might look vastly different when Amazon gets a hold of it. The difference comes in how those files interact with the formatting marks I mentioned earlier. I haven’t experimented with every kind of file, so I can’t tell you yet which works best–what I can say is that, for the sake of your own sanity, the easiest thing to do is start with a raw file. I do a lot of my writing in MS Word through Google Docs–because it’s accessible anywhere, even on my phone–and copy and paste the text into Scrivener. Scrivener can output into several file types, including Real Text Format (rtf) or the MS Word .doc. Of, you can export it as a text file. This is the raw text–no formatting at all. What I’ve been doing is exporting as a text file, then opening up a program called Sigil, a WYSIWYG editor (unlike Word!). Sigilis basically an HTML editor, meaning you’ll be coding in the same way you would a web page–or an eBook. It’s really simple to use, and you don’t need any experience with HTML. Just copy and paste your work, create headings (which will create a table of contents for you), and images if you have them, italicize and bold your text if need be. That’s it! There’s a handy tutorial here, and the whole process isn’t very long or arduous (though poetry is another story–it took a while to get Muzak for the Metro to look right). It might even be simpler, though. I haven’t tried it yet, but I imagine you could output your Scrivener files as an eBook, which would open in Sigil. This way, you do most of your formatting as you work in Scrivener, and use Sigil for touch-ups. Once that’s done, you use Calibre to tweak things like metadata and making sure everything is “just so.” But that’s a topic for another post. This is only the tip of the iceberg when it comes to eBook formatting, but it’s a start, and it’s a lot easier than some might lead you to believe. If you want to check out a sample of just how this turns out, you can go to Amazon to find the eBook I created with this process (including a cover) this weekend, Muzak for the Metro. It’s only $0.99, and it includes a poem that wasn’t in the original collection–plus an excerpt from “Room With a Corpse,” a short story which will appear in my forthcoming collection The Astrologers and Other Stories. Check it out! In yesterday’s brief post, I mentioned that I spent some time this past weekend learning how to format eBooks and make covers. Now, I’m by no means an expert at either, but I learned a great deal–and since this blog is about learning how to publish, why not share what I learned? Today, I’ll touch on creating covers–but fair warning, this is a large topic, so it won’t be a comprehensive how-to. Look in the future for more tips and tricks on making eBook covers. A lot of books get sold because readers are familiar with the author or because they’re aware of the story; some get sold by word of mouth or people reading reviews. But a lot of books are sold because someone was wandering the aisles in the bookstore and found something cool. This is my favorite way to shop for books: browsing. You never know what you’re going to find, so it’s a bit like a treasure hunt. And when I’m browsing, it’s often the books with the flashiest covers that catch my eye. It works the same when you’re buying eBooks, but I’d argue that covers are even more important. It’s easy to just breeze by all the little thumbnails on your screen without giving any of them a second thought. Or worse, picking out a particularly bad cover and deciding (without having read it) that it’s an amateurish or poorly written book. In other words, not worth buying. The sad truth is that people will judge your books by it’s cover–so make it a good one! Now, I’m no artist, so I can’t pretend to know anything about effective composition and drawing the eye to the corner or color theory. But I do know what I, as a reader, like to see in a book cover. I think this is the best place for someone new to start: design a cover for a book you’d want to buy. You may not share everyone’s tastes, but chances are your readers–having chosen to purchase a book in the genre you’re writing in–will share at least some aesthetics. So you’ve got a concept you think will draw people’s attention. What then? There are lots of people online who will design a cover for you, for various fees (I’ve seen them go up to $200 for one cover). I haven’t started generating revenue yet, so I don’t want to pay that right off the bat…but I still need a good cover. Fortunately, my sister-in-law is an artist, and has agreed to help me out. She’s providing the artwork in a digital file, and I’m using graphic design software to make it into a cover. I went to a site called eBook Rights Management, which offers DRM protection for eBooks, as well as templates you can use to design covers. Their covers are free, but if you’re going to use them, it’s only fair to credit them in your book. I mocked up a simple cover, then downloaded the image and loaded it into a program called Paint.net to manipulate the image into what I wanted. This was the arduous part. I’m picky when it comes to this kind of thing, so it took a few hours to get one solid image–the one above–which I’m not completely sold on yet. But it’s a start. While I was making the image, I saved a template with the correct canvas size for an eBook; this will enable me to quickly create new covers without doing all the set up first. The next step was finding a font. The number of fonts you have will depend on your own software, but it’s easy to find new ones online. A word of warning, though: many font packages will cost you, and some of the ones that say they’re free actually aren’t (they involve royalties, or when you click through to download it asks you to pay). Do your research before settling on a font, and make sure you’re attributing it correctly in the book’s front matter. Nothing in this world is completely free, but that doesn’t mean you should rip off someone else’s work! Now all you have to do is put it all together. I’d recommend creating a new layer in your image for anything you add–it will make further edits much simpler. A layer is just what it sounds like: a layer you can edit without affecting the image beneath. I had one for my border, another for the image, a third for my title, and a fourth for my name. It seems like lots of work, but it’s well worth it for the hassle you’ll save yourself. And there you have it: a quick and dirty cover. Of course, this is a very basic way to go about things; I have some experience with image manipulation, but I wouldn’t call it graphic design. If you want a seriously well done cover, you should either learn the programs you’ll be using, or pay someone else to do it. You don’t have to be incredibly ornate, but the end result should look better than something you threw together in MS Paint. And the more professional it looks, the more “Browse Potential” you’ll earn. Got any tips for cover design, or a link to a resource? Post it in the comments! In my ever continuing effort to experiment with this self-publishing thing, I spent much of the day yesterday playing with two programs: Paint.net, learning to make covers; and Sigil, an open source ePub editor, learning to format ebooks from scratch with HTML. It was enlightening–the editing, formatting, and graphic design work in publishing is two or three times the work of actually writing–but interesting. I’ll be sharing my experiences with you in the coming weeks. But I wasn’t just fiddling around. I took my previous “test project,” Muzak for the Metro, and spruced it up a bit. I included a poem that wasn’t in there before–Adam’s Tree–and a snippet of a short story called Room With a Corpse–which will be included in full in my upcoming collection The Astrologers and Other Stories. And now I’m happy to announce that it’s ready for sale on Amazon! You can purchase it here. If you do, please consider leaving a review! The book has also been uploaded to the Kobo store for those of you up here in Canada, but it’s not live yet–stay tuned! I had a conversation with a writer friend recently about Scrivener and backups, and the subject of Snapshots came up. I’ve since learned that Snapshots aren’t really useful as a backup–Scrivener gives you a different option for that–but they’re still really useful. The best part of being a writer–in my opinion, anyway–is creating. That’s why I like to write: I’m a creative person, and I enjoy making things. To be in control of a character or setting, or to invent either from the ground up, is a thrilling thing for a writer. But that’s not really what a writer does, is it? A writer starts there, but the real work is in honing that creative idea into something readable. That’s not an easy thing to do, whatever Mr. Vonnegut says. It takes a lot of attention to detail, a lot of time and effort, and–most especially–a big slice of humble pie. Editing is where you take that incredible, gonna-be-a-millionare gem of a manuscript, and tear it to pieces until it resembles something people will actually buy. When I was in high school, we were given a simple project in English class: write a story from the viewpoint of a character from another story we’ve read in class. I chose a story with a character who was illiterate and uneducated, and had him write a letter to his son. I purposefully filled the story with spelling and grammar mistakes and imposed a lack of clarity, because I thought that was how an illiterate person would try to write a letter. The idea might have been interesting, but I failed the project. Why? It was filled with spelling and grammar mistakes, and suffered from a lack of clarity. The piece needed severe editing, but my insistence to the teacher that “this is how the character would have done it” fell on deaf ears. In trying to be creative, I missed the point of the lesson: to create a cohesive story that was interesting to read. It was, in fact, unreadable–and despite that being the intent, the story ended up being a complete mess that was hard to follow and not enjoyable to read. And here’s the point: properly edited, that story could have been clear and easy to read, while still getting the point across. And that, I think, is the hardest part of the editing process. It’s easy to think about an editor as the one who erases or deconstructs your work–but when you take your ego out of it and understand that editing is in your best interests, you start to see how valuable that process is. An editor will not only check your work for spelling and grammar mistakes, they’ll refine your piece to make it the best it can be. I’m in the throes of this process now. I recently sent a selection of my work for a sample edit from an editor, and the response was surprising. After going over the story twice myself and making my own edits, I thought it was close to finished–but my editor picked up on a lot of small things I’d missed. And that, I think, is the best reason for getting a professional editor to look at your work: they’re going to find stuff you missed. That in itself is worth the cost. 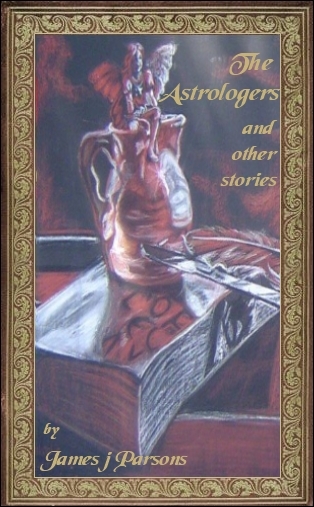 My first collection–The Astrologers and other stories–is ready to send for editing now. This is a step in the writing process that I’ve never taken before, and it’s a bit nerve-wracking. But it’s also liberating. My editor is fellow writer and blogger Yesenia Vargas. She’s just started offering editing services, which you can find more about here. Now, another stumbling block for new writers is the cost of hiring an editor–but Yesenia has great rates (among the best I’ve found), and I can speak to her work being top notch. And, as of the time of this writing, Yesenia is graciously offering a 50% discount to her next four clients! Send her an email quick and get on her list–you won’t find a better deal than that. We’ll be talking to Yesenia about her editing services soon, so stay tuned! Visit the Kobo Writing Life site by clicking on the pic. Yesterday, I talked about my first e-publishing experience. Today, I thought I’d walk you through it. For my first venture into e-publishing, I’m going with Kobo Writing Life. I’m Canadian and Kobo the primary source for buying eBooks up here, and because I own a Kobo myself it seemed a natural first step. Kobo also has agreements to distribute your work to several different eBook sellers which—while it doesn’t yet include Amazon or iBooks—is growing quickly. Finally, Kobo also doesn’t hold you to rights, meaning I can upload the book to an aggregator and get it into other major retailers anyway. Do your research. You can find the FAQ here, and there’s a helpful User Guide once you sign up. Also, be sure to go over the Terms and Conditions. Know what you’re getting into; lots of people use this service and it’s in Kobo’s best interest to work to your best interest, but if you don’t know all the details you could get caught by surprise. Kobo requires that you own the digital rights to your work, but doesn’t claim rights to it. This means that they will let you distribute the book on your own, without their interference (as opposed to, say, Amazon KDP, which requires you sell only through them), as long as you own the rights. If it’s something you wrote yourself, you won the rights automatically, and it’s copyrighted. If it’s a book someone else wrote, you’ll want to make sure you get the rights…but we’re writers here, so this shouldn’t be a problem. Enter your contact information. One thing that caught me is the optional field for your Publisher name. Kobo encourages this if you’re an individual doing business under a different name, i.e. a publishing house. I’m not sure this is strictly necessary, but I imagine it would come in handy if you’re uploading books for which you own the rights, but haven’t written yourself; for example, there’s a (look up that company that does copyright fee books). I put my Publisher Name as Eloquent Eyes Books, a spin on the title of this blog. Here is where you need to accept the Terms and Conditions, which, of course, is a requirement of signing up. If you don’t agree to the terms, you’ll need to go somewhere else. Now, we’re all guilty of just glossing over T&C forms in our haste to just install the software or whatever, but–at the risk of repeating myself–in this case you really need to familiarize yourself with them. You wouldn’t want to get your account suspended because you went against them, or find yourself in breach of contract somewhere. I would add some pertinent notes from the conditions, but one of the conditions is that I don’t publicly share them without their consent. So if you’re interested, check them out by signing up! Once you verify your email address, you’ll be asked to set up payment details. Go to Your Account, and a drop down menu will show you where you need to go. From here you can enter your banking information. Kobo pays you royalties on every book sold, depending on the price—if you fall between a certain price range and conditions, you’ll get 70% royalties; if it’s outside that range you get 25%. You’ll get paid by direct fund transfer into the account your specify about once an month-though Kobo will hold your payment if it’s less than $100 a month, in which case you’ll receive it at the end of six months. Kobo also notes that it may take as long as 45 days to receive payments, though I’m not sure why this is. Step Five: Publish Your Book. This is the fun part, and Kobo makes it painless. There’s a link that says “Create new ebook;” clicking on that will start you on a four step process. First you describe your book by adding a title, subtitle, and series name if applicable; writing a synopsis that will appear in the store; and giving your eISBN number. Purchasing an ISBN is the subject of another article–but note that if you’re a resident of Canada, you can get one for free through the government. You also put your book into a number of categories, which will help buyers find it by browsing through the store. Finally, you can add a cover–we’ll go over that in more detail in another post, but you’re basically just uploading a .jpeg that will show as the book cover in the store. Next you upload the book–Kobo accepts a number of formats, and if you don’t upload it in an .epub file, they’ll convert it for you.Then you set the rights; you have the option to allow the sale of the book in other countries (though I don’t see why you’d restrict that), and whether or not you want DRM protection. Finally, setting the price. Again, that’s a topic for another article; suffice it to say that you can set whatever you like, and Kobo will automatically convert currencies for you for sale in different countries. Or, you can set each country’s sale price individually–though again, I’m not sure why you’d want to. Note that the royalties you receive differ depending on the price you set–for example, if it’s less than $1.99 or more than $12.99 you only get 45% royalties; otherwise you get 70%. *Also note that, for a limited time (until the end of November), Kobo is offering a bonus incentive: 80% royalties on all books within the range noted above. And that’s it. Nice and simple–even as a guy who’s completely new to this e-publishing thing, I had no issues. I’ve also found the Kobo staff to be extremely helpful, and quick to answer questions via email. The only real negative I can give is that they don’t publish your book to Amazon, B&N, or iBooks–but really, they’re not an aggregator, and that would be outside the scope of their business, so you can’t fault them for it. They do put your book out internationally, so there’s still a lot of exposure–and there’s nothing preventing you from also uploading your book to Smashwords or LuLu. So there we are! Next up, we’re back to my current project. I’m in the midst of professional editing now, so I want to take the next few articles to talk about that process. Stay tuned!